To order a plat book via mail, send a check payable to the “Lincoln County 4-H Leaders’ Association” for $35 plus $5.05 for shipping per book. Payment along with address to mail book(s) should be sent to: UW-Extension Lincoln County, 801 N Sales Street Suite 101, Merrill, WI 54452. If you have questions please email Jeni.Burton@co.lincoln.wi.us or call her at 715-539-1037. Now available – SmartMaps of Lincoln County which are digital maps for use on your smartphone or tablet. Premium wall maps of Lincoln County Wisconsin are also available. The wall maps are large plat maps ideally suited to hang on an office wall for quick and easy reference. These maps are printed on 90 lb premium photo matte paper. This is low-glare, high grade paper. These maps combine and condense all the detail within a Plat Book, providing an entire view of the county. The scale varies by the land area size but typically is 1 Inch = .85 miles. The Lincoln County printed map size is 42 x 48 inches. 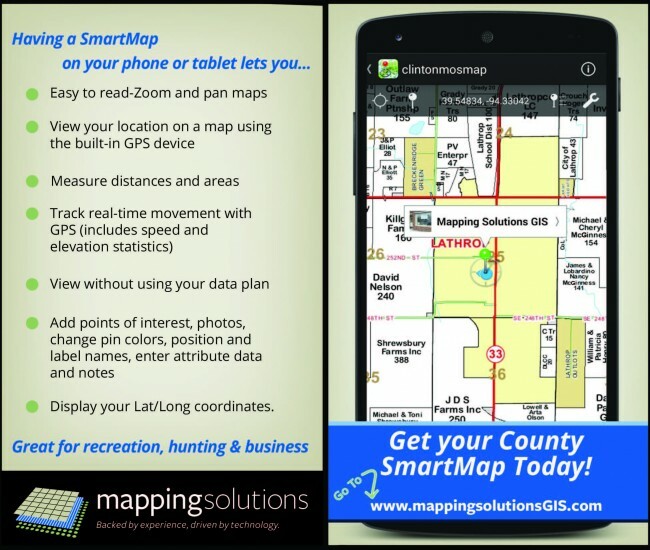 Go to – http://www.mappingsolutionsgis.com/categories/bc-drop/wisconsin/lincoln/ for more information or to purchase this new SmartMap or wall maps. 4-H in Lincoln County will also receive a portion of sales to support educational programs. If individuals are interested in a specific Township map, those can be ordered from Mapping Solutions at 816-903-3500. 4-H is a community of young people across America who are learning leadership, citizenship and life skills. A portion of the sales price of the plat book will be used to support 4-H educational programs in Lincoln County. No endorsement of the product by 4-H is implied or intended.